marketing solutions with a hyper-local focus! The Digital Marketing division is comprised of a team of experts performing full service digital magic in Web Design, Social Media Marketing, Video Production, Web Ad Display, and Text Message Marketing. The SCMM Events Division currently produces (7) trade show events each year & implements marketing for the events and its partners. The Expos are designed to create an environment for consumers to find the products and services they need to create the home of their dreams or the life of their dreams. Simply Clear Marketing & Media, Inc. is a family owned and operated marketing, publishing & event management company founded in 2005 and located in San Luis Obispo, CA. Our company mission is to help small businesses grow by connecting them with potential clients through our unique marketing mix of products & services. Our dedicated experts in print, digital & tradeshow marketing are excited to assist you in reaching your marketing goals! View some testimonials from our most valued clients. We offer an array of services to all of the companies that we work with, all of which are executed with the upmost integrity and skill. "We love working with you and your company. You are always kind, fair , and have a pulse on what’s going on in our community and are able to meet our needs quickly. We appreciate all you do, and feel you represent your company well. It is a pleasure doing business with you". We are enjoying the agenda atPaso Robles Chamber of Commerce Wake Up Paso! Behind the scenes: Island Ninja Grant Mccartney talks to KSBY about why he comes back to our Inspired Health Expo! Stop by the Alex Madonna Expo Center March 23,10-4 or March 24 to say hi to Island Ninja! 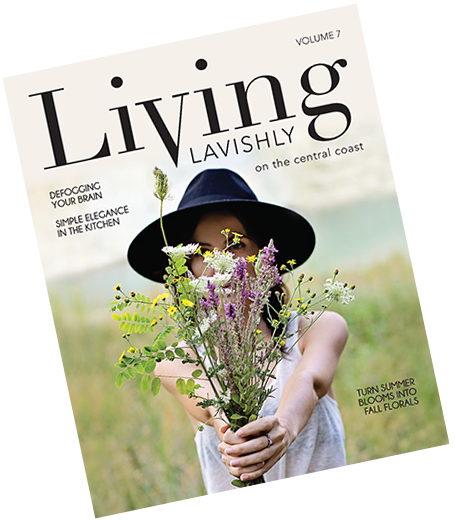 Check out our latest issue of Living Lavishly Magazine! We had a fun time putting this together and hope you enjoy reading about some of the local talent the central coast has to offer!